A Life of Sugar and Spice: We Did It!!! 5K Recap! Woooooooo, am I glad that's OVER! We woke up Sunday morning to a HUMID, overcast day. We set off for the starting line and arrived early enough to check out the competition. 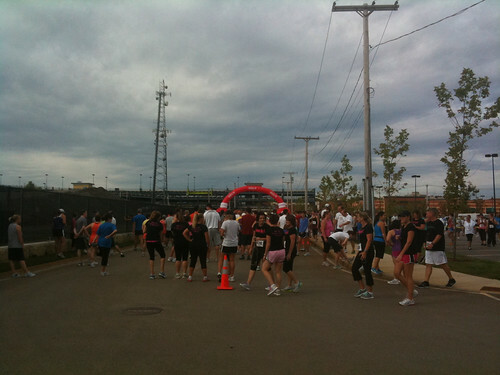 There were some serious runners here, I was a little bit intimidated. Ok, maybe a lot. We walked around and checked out all the vendors, pinned on our bibs, and took our places at the very back of the pack. Did some light stretching. Snapped some really bad iphone pics. And then they blasted the air horn and we were off! B is much better at this than I am, so he took off at his own much faster pace and I stayed behind at the back of the pack. The way back of the pack. Pretty much I was the last "runner" of the race. Behind me were moms with strollers and people that deliberately came to WALK the whole way. I definitely struggled. Between the humidity and the cramps I found myself walking a lot more than I wanted to. But I pushed through and as I rounded the corner to the final stretch, there was B waving me in. There was a girl ahead of me the whole time and she was walking the last leg of it and there was no way I was letting her beat me! I sprinted the last of it and just crossed the finish line ahead of her. With B there cheering me on and the rest of the people at the finish line clapping and cheering it was pretty awesome. I even got a little choked up! Finished!! B wound up finishing in 32 minutes, I'm so proud! It took me 45... ouch. But I'll take it! I quickly went over to the water station, downed a few cups of water, sat down for a few minutes, then we got up and took advantage of all the free goods from the vendors. I was excited to find a lot of goodies that I could take home. Unfortunately I didn't get any photos of any of them. :( My favorite item of the day was a gluten/casein free protein shake which I immediately downed. It was a delicious, Mix1 All-Natural Protein Shakes - Chocolate flavor. (concerned about the casein/lactose content of Whey Protein? See this article) They also had a physical therapy team doing post race stretching for the runners. I definitely took advantage of that. Also they are offering $15 off a 1 hr massage at their location for anyone that ran the race. I think I might have to take them up on that offer! 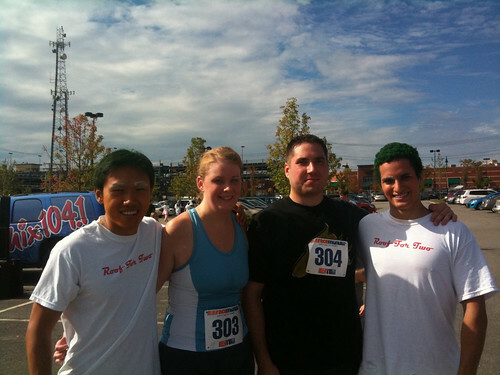 Just before heading home, we grabbed a photo op with the guys that had run dressed as Oompa Loompas! Too bad they had already changed out of their shirts and washed off their orange faces, but you can still see a little orange and the green hair. Too funny. It was awesome. I'm so glad I did it. B wants to sign up for more, he mentioned once a month! I think he's a little crazy, but we'll see. I definitely already scoped out some upcoming races. Thanks everyone for all your encouragement leading up to this day. I'm so glad it was a success! Yay, congrats Jen! What an accomplishment. Proud of you! Congrats to you, Jen!! I am SO proud of you!! Awesome job! 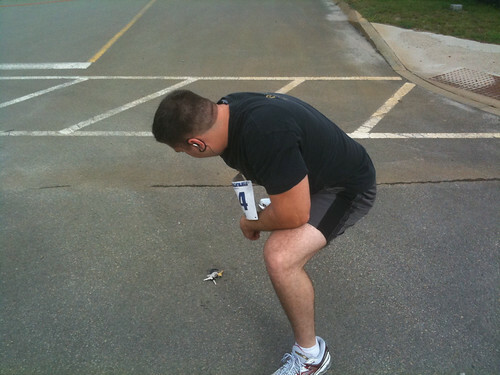 I remember my first 5K, it was crazy, all I wanted to do was finish it! 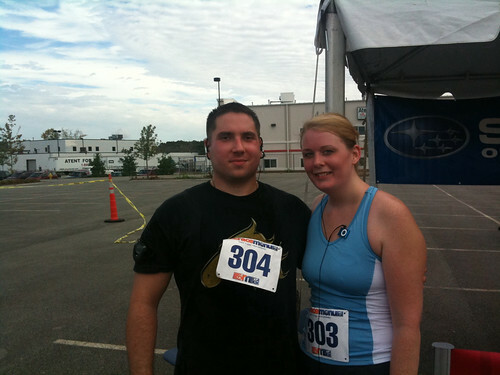 Keep up the running, I'm on my second half-marathon this weekend, and my first 5K was just about 2 years ago, so you never know how you'll do! Also, corn/rice chex and almond milk make an awesome post-run snack. Mmmmmm. You look amazing! Keep up the good work! So proud of you!!! !